June Club Minutes can be accessed below or by using this link. ● The meeting was called to order by Tinker Moats. ● The minutes from the April Meeting were read. 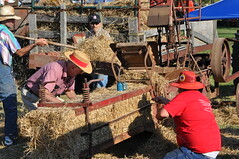 A correction was made concerning the Tractor Games under Activities for the Summer Show. Bobby Menefee said he would help with the games instead of coordinating them. The correction was noted. A motion was made to accept the minutes with the correction. It was seconded and approved. ● The Treasurer’s Report was given. There is $2,914.11 in the checking account. 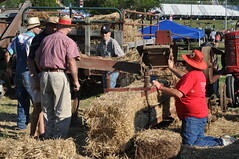 The cost to the Fairground for the Summer Show is between $900.00 to $1500.00. Steve Kegley was not available to give the amount. ● The Advertising Report was given. A motion was made to set the budget at $500.00, but if more was needed to proceed with what was needed. It was seconded and approved. ● The Food Report was given by Joey Kline of J&J’s Bar B Que. Breakfast would be available Saturday and Sunday mornings. They will have hot dogs, hamburgers, pulled pork sandwiches and plate meals to include BBQ , Chicken and Ribeyes. There also would be drinks and snacks. ● Tyrone gave the report on vendors that had committed to the show. He is still working on other vendors. ● Kids Activities: Gary Mitchell will have general activities for kids in a designated area. ● Barrel Train: Jerry McDonald said the train would be ready for the Show. There was discussion about having a set area for the train to run so it would not interfere with pedestrian traffic. ● Set up ­­ Clean up: Bill Shaver and Berlin Zirk will coordinate these items. ALL HELP is needed with clean up. ● PA System: The system is still questionable, but will continue to look into it. 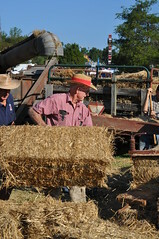 ● Threshing and Baling Activities will be handled by Jerry McDonald. ● Auction: There are pictures of auction items on the website, Fairbook and Tom Weaver’s auctionzip.com. Winona said we still would like to have more items. ● :Vendor Spaces: There are still spaces available inside. Becky said she was talking to some people about being inside. ● There will be Kettle Korn and ice cream available. ● Relay for Life Team: Becky reported that Relay for Life made $10,000.00. ● Newsletter: Winnona said she still needed information for the Newsletter. Either email her or call her with anything you wanted put in the Newsletter. There will be information about the Summer Show in the Newsletter. ● Shuttle: There will be a golf cart available for transporting people if needed. ● The upcoming shows where our club will be represented are Berryville, Sommerset and Rockville. ● Jennifer said that yearly dues are due now. ● The meeting inside was adjourned to be continued outside for discussion of where displays were to be set up. Tyrone would make a map which would be available to the members. ● The meeting outside was adjourned.